Peter: [to paulie] Oh yeah, at least I can read the labels you illiterate mook. Just about as corky as you would expect. 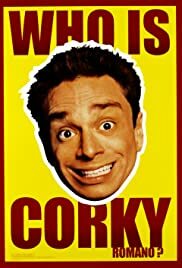 Corky Romano is obviously a vehicle for the absurd comedic talents of Chris Kattan, but it's good to see that he is able to slow down and be serious when the content of the story calls for at least a tiny bit of seriousness. It's odd that a movie like this, that is clearly made to be goofy and stupid, still manages to be not nearly as bad as something like Mickey Blue Eyes, which similarly dealt with someone trying desperately but in vain to fit in with a Hollywood-style Italian crime family. As is to be expected in a comedy like this, the characters are skewed just enough to make them weird and goofy, like the one brother who is manly and violent but latently homosexual, or the other one who has become a full-grown man without his own father ever realizing that he never learned to read. Evidently there is a huge case against the father of the family, although he is only guilty of the lesser crimes like money laundering and whatnot, not the murder that he is being charged with. In order to destroy the evidence that they have against him, they need someone to get a job on the inside, get into the evidence room, and destroy the evidence against him. Since they can't have someone do it that the feds would recognize (and also since, obviously, they can't trust someone outside the family), they have to have their somewhat estranged brother Corky, the black sheep of the family, do the job. Or maybe `the yellow canary' would be a more apt description of him. Or maybe something pink. A pink canary in a whole family of black sheep. Corky accepts the task out of respect for his father, despite the fact that he has not been a very big part of Corky's life, but he grows cautious when he finds out how serious the charges are. Corky's antics while he is working for the FBI are some of the least convincing things that I've ever seen in a movie, it's almost insulting that we're asked to believe that someone who behaves like he does would acquire so many fans within the Bureau almost immediately. There are a couple guys who work with Corky who are so enamored with him and look up to him so much because of his accidental successes that they are more like cheerleaders than FBI agents. Some of the slapstick scenes are miserable failures, but at least it's easy to see why they were expected to work. There's a scene where Corky has a tug of war with a dog that's trying to get a package of cocaine away from him. It ends up exploding and getting all over both of them, and the ensuing madness is expected to be funny, but it's the worst kind of comedy - it's funny until you stop for a second to think about what you're laughing at. Charlie Chaplin did this exact same scene with spectacular success in Modern Times in 1936, so it's almost sad to see it redone so badly here. Matthew Glave pops into view again after giving a spectacular performance of a spectacular jerk in The Wedding Singer to play another spectacular jerk in Corky Romano as the rival FBI agent who is sure that there is something up with this new guy that doesn't quite fit. He is constantly thwarted in his efforts to expose Corky and then immediately begins to act like a high school kid not getting what he wants (`Aww come on!!'). I would say that this is just another goofy SNL movie except that there have certainly been some good SNL movies. Corky Romano is, however, nothing more than you would expect from the previews. It is a series of scenes involving the overacting of Chris Kattan, which just leaves you hungry for less.